Red Circle Minis on sale at a Kinokuniya bookshop in Tokyo. All the titles in the newly launched series Red Circle Minis went on sale today at Books Kinokuniya Tokyo, the flagship store of one of Japan’s most important and influential bookshop chains. Kinokuniya, like other retailers in Japan and internationally, started promoting and taking orders online for the first three titles in the series in advance of publication last week, but Kinokuniya is the first retailer in Japan to display and promote print copies of the books in its physical bookshops. Kinokuniya, founded in 1927, has more than 50 bookshops in Japan and a growing international presence with retail outlets in Singapore, Sydney, Dubai, Taipei, Bangkok and New York, to name just a few. Kinokuniya’s international presence is expanding with its next new store planned in Katy Texas, a state where it already has several successful bookshops. The Red Circle team meet with the international books team at Kinokuniya this week in Shinjuku to discuss how best to make this exciting new series of short books by Japan’s finest contemporary writers accessible to readers worldwide and available for purchase through Kinokuniya’s local and international channels and shops. Red Circle Minis is a series that brings the narratives and voices of Japan together as never before. Each book is a first edition written specifically for the series and is being published in English first. 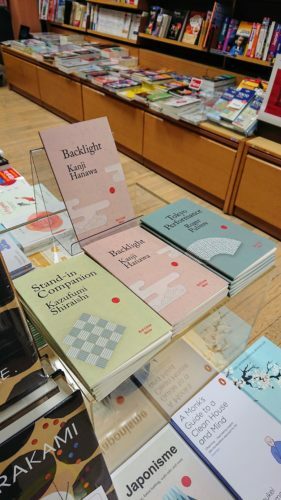 The first three titles in the series are: Stand-In Companion by Kazufumi Shiraishi (translated by Raj Mahtani); Backlight by Kanji Hanawa (translated by Richard Nathan); and Tokyo Performance by Roger Pulvers.